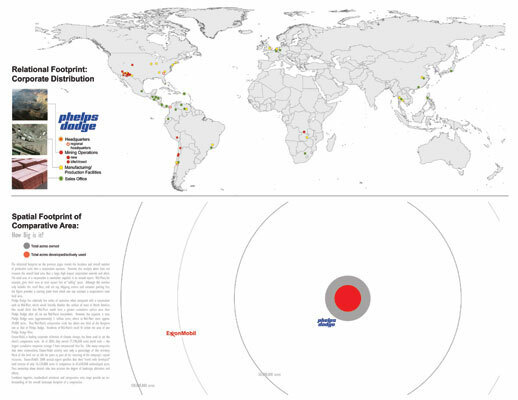 (2) 2 page spreads of mappings of Phelps Dodge Corporation showing global network distribution and comparative total land area. Together, the two maps provide an overall spatial ‘footprint’ of a corporation. 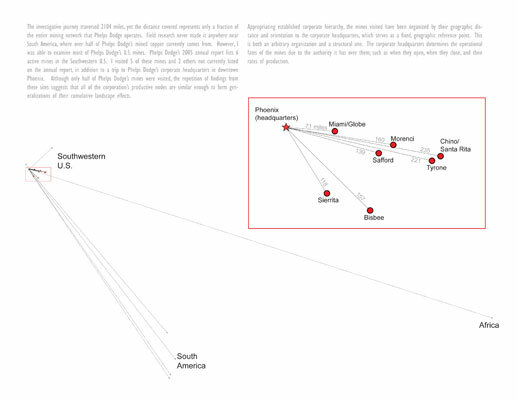 (2) Spreads showing the repetition of landscape effects from one node of operation to another. This repetition is demonstrated through aerial plan views and on-the-ground site photographs. 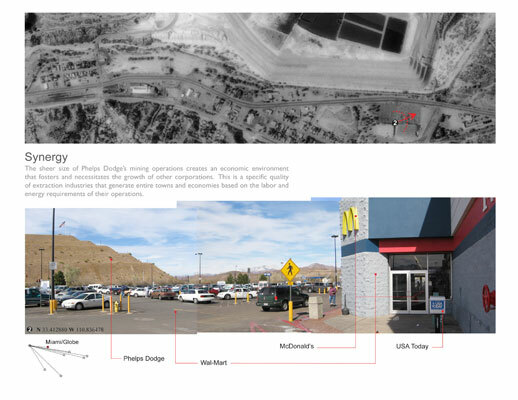 2 Diagrams showing all of Phelps Dodge’s Mines in relationship to the corporate headquarters. The second diagram shows the mines visited as part of this research. 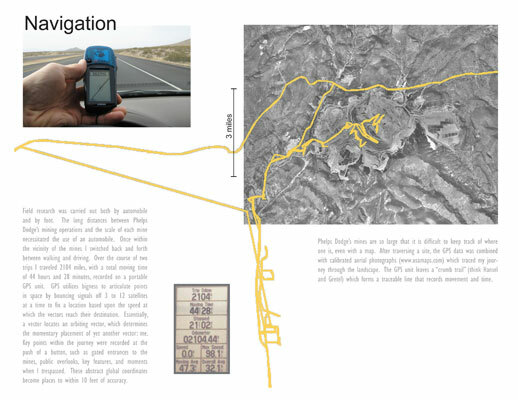 Calibrated aerial photographs combined with GPS routes were used to navigate between and within the geographically dispersed sites. 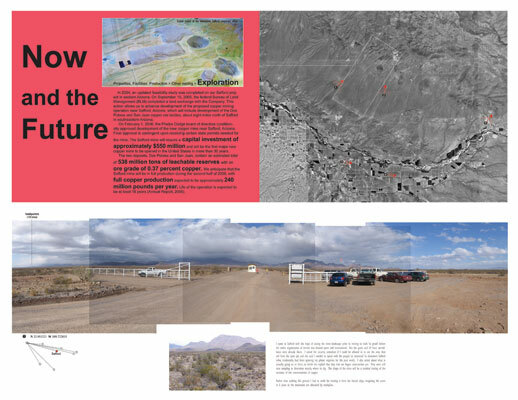 (2) 2 Page spreads of the Morenci mine. The productive sites visited became the organizational chapters of the report. The graphic format of oversize title, borrowed text from Phelps Dodge's 2005 annual report, and aerial and panoramic photographs was used consistently for each chapter. "A major achievement. 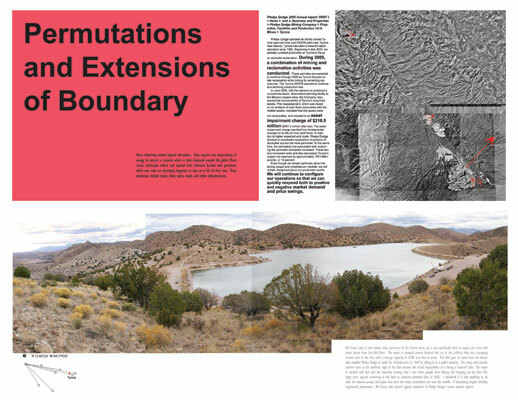 This provides a new window on global landscapes and tackles a huge issue." This study seeks to redefine corporate landscape by examining the footprint and effects of corporate production. As a premise, corporations are defined as geographically dispersed systems that occupy and transform landscape in specific and repetitive ways. 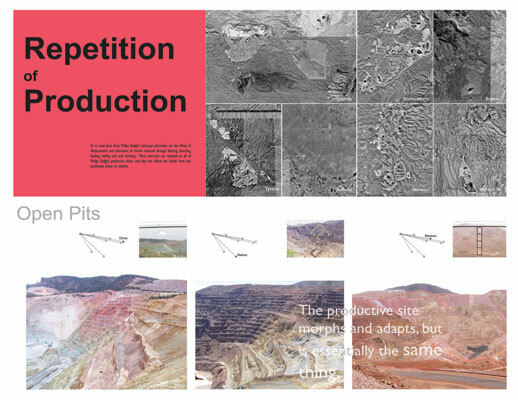 To test this definition, a specific corporation (Phelps Dodge Mining Corporation) was mapped and researched in the field to translate what the abstracted production and financial data of their annual report meant for the physicality and experience of their landscapes. As a design strategy, the standard inventory of corporate annual reports was appropriated to create an addendum, or expanded report of corporate effects that shifted the focus from finances and total sales to the concealed qualities of corporate productive landscapes. Conclusions demonstrate a remarkable similarity in landscape effects from one node of production to another within a non-contiguous corporate landscape network. Corporations exert more influence, control, and ownership over built form than perhaps any other organization or collective. Corporations confound traditional notions of boundary and are found in just about every cultural space. How do we as landscape architects conceptualize and design with these entities? I believe we start by examining what corporate landscapes really are, which requires a working typology for bigness, or geographically dispersed landscape systems. 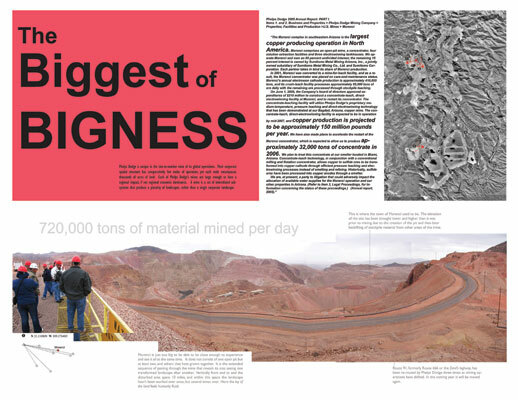 Bigness refers not only to corporations, but to all large-scale systems that extend through multiple landscapes. Landscape architecture has a tradition of operating at a single-site or contiguous land scale, and the articulation or intervention of a dispersed, multi-site condition is rare. Yet now more than ever, this is the manner in which the everyday landscape operates. The reliance on larger and larger extensions of physical and virtual infrastructures places us within abstracted environments in which the functional elements of their operation are unseen and taken for granted. I believe this study is valuable in revealing the vastness of these economic systems and making their dispersed physicality visible. This study has attempted to articulate an inventory of landscape effects for large-scale, global corporations by redefining and appropriating a set of existing typologies within landscape architecture and the world of business and investing. The emphasis has been on landscape effects because such effects are tangible, physical things bound to place. The corporate annual report is an inventory that all publicly-held corporations are required by law to submit on a yearly basis. This document requires that corporations reveal current financial information about their properties and holdings in order to allow potential investors to make educated decisions regarding whether or not to invest in the business. This inventory is a highly abstracted list of various quanta, such as total revenue earned, total assets and sales. Beyond the financial data of an annual report, corporations are free to include additional information as they choose, in any format they desire. In both the optional narrative and the required financial data there is no inventory of landscape effects that result from corporate productive processes. As a design intervention, I offer an alternative annual report, or an addendum to the current requirements that supplies an inventory of a corporation’s landscape effects. This report provides a method for navigating and imaging corporate space, and puts forth comparative standards that could be applied to all corporations. 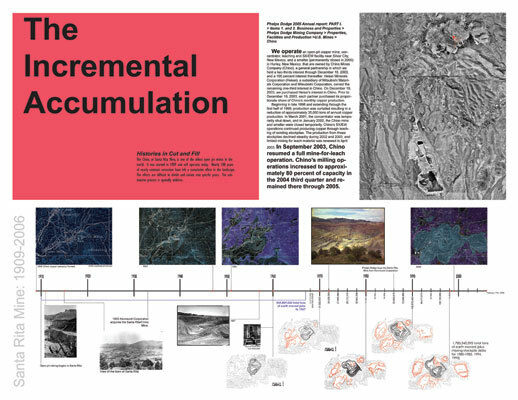 The report moves beyond the controlling rationale of the strictly quantitative narrative and broadens the disclosure to include the phenomenological or experiential aspects of the landscapes that a corporation produces. This loose dialogue exploits the freedom of the annual report narrative, which allows readers to formulate other corporate images and reveals an aspect of corporate production that is often concealed. The goal of this expanded inventory is to affect environmental designers, investors, the public, and in turn, the corporations themselves. Information and the way it is portrayed is extremely influential. Particularly in the last few years, information regarding the negative effects of corporate production has become commonplace and the public now expects corporations to be responsible for more than profits. The goal of the expanded inventory is not to harm corporations, but to help ensure they operate responsibly, and reveal and support those companies that are working towards sustainable practices while deterring support and investment for those that are not. The alternative annual report designed in this project bridges the tactile experience of the site-specific with the abstractions of the global by focusing on the repetitive insertions of corporate production. The central argument put forth and supported by the research of this thesis is that because corporations are hierarchically organized and thus deliberate, consistent and repetitive in their operations, generalizations can be made about their landscape effects. Every corporation has a specific way they use, occupy, and transform landscape which is replicated throughout their productive system. Although global economics are rife with uncertainties, fluctuations and indeterminate outcomes, the focused goals of profit and growth and the productive means and effects of achieving those goals are comparatively predictable for a given corporation. Phelps Dodge Mining Corporation, the global corporation inventoried for this project, has a very particular spatial form. As an open-pit mining operation, it has comparatively few nodes of production: 10 world-wide. Yet each of these nodes is massive in size, covering thousands and thousands of acres. The sheer size of these operations served as an interesting example in which to test the assumption of productive similarity. I questioned if each of these huge operations would be similar enough to generalize about their effects. After testing this theory by visiting and analyzing 7 of Phelps Dodge’s mines, I determined that although there are differences and variations from one site to another, the overall effects and residual landscape forms demonstrate remarkable similarities across broad distances. The results also revealed that the extent of corporate effects can go far beyond their fenced perimeter, having the potential to dominate the economy and environment of entire regions. Beginning of the Santa Rita Mine chapter, emphasizing the incremental and cumulative quality of mining effects within the landscape. The time line tracks the 95 year history if this particular mine through a variety of information sources, such as USGS topography maps, and data from Phelps Dodge's operations and annual reports. 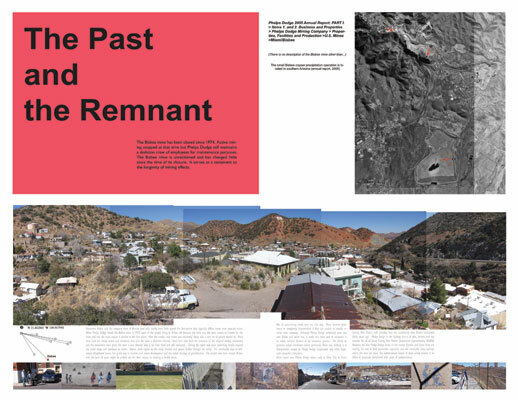 The Bisbee chapter discusses the remnant effects of Phelps Dodge’s productive process that have persisted long after mining has ceased. The Bisbee mine was closed in 1974, yet continues to be strongly influenced by its association and dependency on Phelps Dodge. The Safford Chapter demonstrates the predictive landscape effects that Phelps Dodge’s newest mine (construction began this year) will have on the region in which it is inserted. This predictive quality is a significant benefit gained by documenting corporate effects. The Tyrone chapter illustrates how Phelps Dodge’s productive effects extend far beyond their fenced boundaries, creating a plethora of landscapes and regional economic impacts. Corporate ecologies. The final chapter emphasizes the interweaving and interdependency of multiple corporate operations. Phelps Dodge creates environments and cultural landscapes that necessitate the growth of other corporations.